KCMO City Manager Troy Schulte is opening the solicitation process for qualified companies interested in designing, building and privately financing a single terminal at Kansas City International Airport. Schulte is directing the Procurement Division to publish a Request for Qualifications/Proposals (RFQ/P) for the KCI Terminal Modernization. The proposal will include the requirements that have been the focal points of recent discussions and will reflect what the airlines agreed to a year ago. "This is a win for Kansas City," Mayor Sly James said. "Our airport is the most vital investment we make in order to share our city with the world. And now we know firms are ready to compete to make our airport as world-class as our city." A privately financed airport terminal idea is believed to be the first-of-its kind in the nation. An innovative model, the airport would receive financing through private investment, paid for by airport usage fees, with no funds coming from the City’s general fund, taxes, or existing bonds. The company selected would develop the design at their own risk. The RFQ/P is being issued Tuesday, May 30, and will be due on June 20, which is a standard, three-week period. Companies submitting proposals should be prepared for in-person presentations on June 22 with the selection committee. The best proposal will be selected after reviewing all of the proposals and presentations. The winning proposer will still have to develop a memorandum of understanding (MOU) with the City -- a process that allows both parties to continue their due diligence prior to a public vote. Even during this process, the City will conduct public meetings to provide updates and answer questions. The City will continue to own and operate the airport. Additional information can be found at kcmo.gov/newkci. What likely began as an ordinary evening on May 20 back in 1957 quickly turned deadly as an F-5 tornado tore a 71-mile path of destruction, beginning in Spring Hill, KS, and bouncing through Ottawa, KS, Grandview, Hickman Mills, Martin City, Knob Town and Ruskin Heights. May 20th marked the 60-year anniversary of the tornado that thrashed through the area. 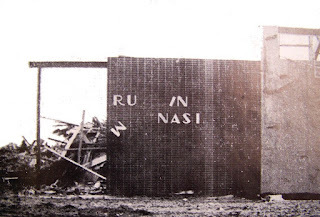 Ruskin High School suffered extensive damage, including the almost complete destruction of the gymnasium that was supposed to house the high school’s graduation ceremony the very next evening. All that remained on the sign for the gym was a few haunting letters: RU IN. The 1957 tornado, deemed the Ruskin Heights Tornado, took the lives of 39 people, with more than 500 injured. Roughly 400 homes were damaged or destroyed. In the last few years, survivors, many of whom were young children at the time, have found solace and comfort through a social media group created on Facebook. With 673 members, “1957 Ruskin Heights Tornado Survivors CAUGHT EVER AFTER” is dedicated to providing an outlet for shared memories and a bond that has lasted a lifetime. Dave May, who would later graduate from Ruskin High School, recalled that the horrific night brought the community closer. Diana Leonard’s family home sat just south of the tornado path, and while her family didn’t see extensive destruction to their property, the storm left a lasting impact on their lives. Ellen Robinson, then a newly-advanced kindergartner from Tower School, took to the Facebook group to express her gratitude to other survivors of the Ruskin Heights Tornado. The memories from the Ruskin Heights Tornado of 1957 are everlasting, with the impact and the loss much greater than homes being destroyed. Loved ones were lost and the lives of the survivors were forever changed. Each year, the anniversary of the tornado is commemorated with the laying of wreaths at the site of the memorial in front of Ruskin High School. For 60 years, the Ruskin community has mourned the ruin and the devastation, but despite the tornado’s impact, the survivors continue to share their stories with each other and with the next generations. The Uniting at Southwest group is proposing to reopen Kansas City’s Southwest High School as an autonomous public school to be under the umbrella of the Kansas City Public School district. Group representatives Mike Zeller and John Couture laid down some of their plans at the Sixth District Second Fridays meeting on May 12 at the Trailside Center. Uniting at Southwest’s plan is to make Southwest into a diverse project-based learning school that helps students identify opportunity, conduct research, and work with others to develop solutions and essential skills in today's world. Zeller lives about three blocks from the Southwest High School building, which closed after the 2015-16 school year. According to Zeller, many people are leaving Kansas City and moving to cities such as Lee’s Summit, Raytown and Prairie Village. When Zeller took the innovative idea to the Kansas City Public Schools district last fall, they indicated that the school was closed because there was not enough demand for it. About 1,200 people have taken the group’s online survey. “They have indicated that they would strongly consider sending about 1,350 children to this school,” Zeller said. According to Zeller, quality integrated public education in the city was not a common belief by most parents about 15 years ago. But they do believe in it now. The Bloch, DeBruce, McDonnell and Stowers Foundations are funding the Uniting at Southwest group’s research and development efforts. Zeller listed the UMKC Dental School of Law and Penn Valley as examples of institutions that are helped out by philanthropic resources. According to Zeller, if Uniting at Southwest is unable to partner with Kansas City Public Schools, the group plans to partner with an existing charter school or create their own charter school. Uniting at Southwest’s plan is to begin with just freshmen during the first school year. Grandview Aldermen interviewed candidates seeking to manage the Farmers Market at the board’s work session held Tuesday, May 2. Those applying for management were Grandview Main Street and the Farmers Market’s current manager Larry French. Grandview Main Street’s focus would be to expand upon the existing Farmers Market, with functions such as a wine walk, food trucks, family-friendly entertainment and events, Christmas in July and potential partnerships with 8th and Main and the Grandview Arts Council, to include activities such as music and sidewalk chalk art. Ward One Alderman Damon Randolph asked Grandview Main Street representatives what they thought the Farmers Market’s biggest challenge is. “Marketing. I live here and I forget about it often,” Grandview Main Street Secretary Kim Curtis said. Grandview Main Street added that they can provide marketing for the Grandview Farmers Market event through social media outlets, the Grandview Chamber of Commerce and the Jackson County Advocate. The Aldermen discussed marketing the Farmers Market with electronic signs. Alderman Ward Three James Crain expressed concern about Grandview Main Street having the manpower to volunteer for events that complement the Farmers Market. Ward Two Alderman Annette Turnbaugh expressed interest in French and Grandview Main Street taking partnership in leading the Farmers Market. Mayor Leonard Jones believes an operation should be run by one leader opposed to many. French wants to keep the originality of the Farmers Market. Jones prefers the Farmers Market be held on a day during the week. Alderman Ward Three John Maloney asked French if Farmers Market attendees are seeking any particular items that current vendors do not already provide. French’s answer was certified organics. According to Ward Two Alderman Brian Hochstein, the Farmers Markethas received very little interest from the community. Hochstein, who is sometimes a vendor at the Farmers Market, said that he had a net loss in his first year of selling. Hochstein has in the past heard comments about how expensive the vendors’ products are. Ultimately, three aldermen voted for French to continue the management of the Farmers Market, two voted for Grandview Main Street and one voted for a partnership. Jones stated he would like the Farmers Market to provide additional vendors. French has managed the market for the last several years, and also works as Grandview Farmers Market’s main vendor each week. Jones responded to the question of if French being a Farmers Market vendor and the manager is a conflict of interest. Despite not receiving the nod of approval from the Board of Aldermen, Grandview Main Street plans to continue with the idea of bringing the local community back into downtown. Jones likes Grandview Main Street’s idea to get away from the norm, and looking for additional event opportunities. The Grandview Farmers Market runs from 7:30 a.m. to 12:30 p.m. every Saturday on the southwest corner of the intersection of 8th and Goode Avenue. What began as a family-friendly event last weekend quickly turned into a potentially dangerous situation, as a large fight erupted during the Truman Heritage Festival on Saturday, May 6. According to Grandview Police, a large fight involving both juveniles and adults broke out at the carnival being held in conjunction with the festival on Byars Road in Grandview, and multiple arrests were made. “An adult female involved in the fight sprayed pepper spray indiscriminately into the crowd including on police officers trying to break it up,” said Grandview Police Captain Richard Rodgers. A single gunshot was fired by an unknown suspect in the same area, though no one was reported to be injured. Due to the large number of individuals involved in the fight, a mutual aid request was made to neighboring law enforcement agencies to assist in clearing the crowd. Officers from the Kansas City Police Department, the Jackson County Sheriff’s Department, the Belton Police Department, the Lee’s Summit Police Department and the Missouri State Highway Patrol responded to assist. Chira S. Smith, 33, from Grandview, was arrested for fighting in public; Ashley M. Plunkett, 30, from Paola, KS, was arrested for assault on a police officer and failure to obey; Bryson M. Sylvain, 29, from Belton, was arrested for failure to obey; and Brittany N. Rymes, 17, from Grandview, was arrested for fighting in public. A 15-year-old juvenile male and a 16-year-old juvenile female, both from Grandview, were also taken into custody. The male was arrested for assault on a police officer and the female for fighting in public. No injuries resulting from the disturbance were reported with the exception of those exposed to pepper spray. The City of Grandview and organizers for the Truman Heritage Festival on Sunday released a statement saying that the incidents that occurred are not indicative of the community. With the safety of everyone in the community remaining a priority, the statement added that organizers will be reviewing festival security procedures and plans, as well as security for future events. Visitors and vendors of the festival took to social media following the incidents, expressing concern and outrage, including those there with small children. The adults arrested were charged through Grandview Municipal Court and the juveniles will be referred to the Jackson County Family Court.